© Fagbami et al. ; Licensee Bentham Open. Adherence to antiretroviral therapy reduces morbidity and mortality; however rates of non-adherence are variable among women for unclear reasons. This study was a single-center qualitative analysis of interviews with 18 female HIV-positive non-adherent patients (defined by virologic failure) to explore psychosocial factors impacting adherence. Factors identified were categorized as promoting, inhibiting or having no effect on adherence. Three themes, characterized as social factors, illness factors and other societal pressures, were identified. 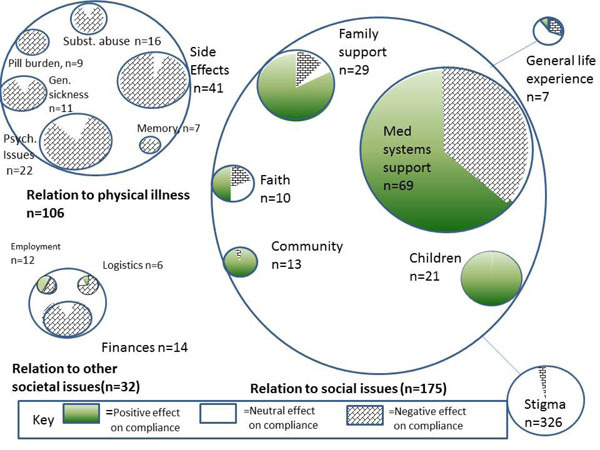 Medical systems support, family support and compliance for children were most commonly identified as promoting adherence, while psychiatric comorbidities, lack of medical systems support and side effects were identified most often as inhibitors of adherence. While stigma was frequently identified, it was not seen as a barrier to adherence. Enhancing relationships between patients and their providers as well as their community support systems are critical avenues to pursue in improving compliance. Interventions to promote compliance are important avenues of future research. Keywords: Adherence, female, HAART, HIV, medication compliance, qualitative research. Adherence to Antiretroviral therapy (ART) reduces morbidity and mortality, risk of viral resistance and transmission to sexual partners and children. However, for ART to be effective, adherence must be nearly complete, as even above average levels of adherence (80-90%) are associated with treatment failure in 50% of patients . Non-adherent patients are noted to have an overall mortality risk that is 3.8 times higher than that of adherent patients . Adherence is therefore of critical importance to individual patient outcomes as well as an overall public health concern . Only 88% of women living with HIV in the United States are diagnosed, with 45% noting regular access to healthcare. Of these, 32% have their disease well controlled on ART . Reported rates of non-adherence to ART in women range from 33-75%, a rate which is generally worse than reported non-adherence rates in men [5-7]. Women have also been found to have increased viral rebound following non-adherence episodes , making their non-adherence behaviors potentially more morbid. Factors that have been associated with non-adherence in women include depression [1, 8-10], alcohol or substance abuse [1, 10, 11], medication side effects [10, 12, 13], stigma [11, 13, 14], lack of social support [1, 8], and poor patient-provider relationships [1, 9, 12, 13, 15]. While no demographic traits can reliably predict adherence , patient attitudes and beliefs have been identified as important predictors of adherence . Despite the advent of simpler ART regimens with better side effect profiles, non-adherence still remains an important public health concern [1, 13, 14]. We hypothesized that women with less than optimal compliance with ART would have important and potentially causal attitudes, beliefs and unmet psychosocial needs that contributed to their non-adherence. This study was a single-center qualitative analysis of interviews with female HIV-positive non-adherent patients. It was aimed at exploring both positive and negative factors impacting adherence. This study was a qualitative analysis of individual patient interviews. Using purposeful sampling , participants were recruited from the Reading Health’s Center for Public Health. Individuals were chosen for recruitment from the 185 female patients aged older than 18 who carried the diagnosis of HIV infection. In order to identify a subset who may have been non-adherent to medication regimens, we selected the 105 records of those with any evidence of failure of virologic suppression, defined by a viral load of >200 copies/ml in patients already prescribed antiviral medications (as has been used by the HIV/AIDS bureau as a benchmark of treatment failure . Forty patients without either viable listed contact information or could not be reached on successive calls were further excluded, leaving 65 patients who were contacted about our study and asked to participate in a one hour interview. Forty agreed to participate in the study and were scheduled for formal consent and interview, and eighteen patients completed the interview process. Participants were compensated with a $25 gift card as compensation for their time. A semi-structured interview guide  was developed from an extensive review of the literature to broach potential barriers to adherence to therapy in women. A priori topic areas  identified included economic issues (job security, financial responsibilities, medication costs and co-pays), family issues (including need to care for children and the impact of support from loved ones), psychiatric issues, substance abuse issues, educational factors (including formal education and understanding of disease), healthcare logistics (appointment timing, availability of transportation), trust in providers and healthcare systems, overall health issues and their impact on adherence, medication side effects, pill burden issues, use of non-traditional medicines, spirituality issues, and the patient’s own sense of responsibility for their health. Two female interviewers (including one physician (either OF, AO) or one certified nurse practitioner (RF), along with a communication specialist with extensive experience with qualitative research (CF) performed all of the interviews. One interview was with a Spanish-speaking only participant and was performed with the aid of a certified female Spanish interpreter, while the rest were performed in English. All interviews were de-identified and recorded on audiotape and transcribed by the hospital’s transcription service. An initial inductive thematic analysis  of the data was conducted independently by the four principal investigators (OF, AO, AD, CF). Based on this initial review, a detailed codebook was developed from the previously identified themes and those detected from the initial thematic analysis. All four investigators then re-reviewed the text and coded the narrative. Finally, the four investigators reconvened to reach agreement on the identified themes, and determined whether the identified theme was helpful to compliance, a barrier to compliance, or had no effect, with each decided by consensus. The unit of analysis was a phrase, sentence or paragraph of any particular section of narrative that was a potential explanatory factor in non-adherence. Quotes were corrected for grammar and changed (indicated by brackets) to improve readability and to make the author anonymous. Eighteen females completed interviews. The average age of participants was 47.7 (SD: 10.2) years. Ten participants (56%) were Caucasian, five (28%) were Hispanic and three (17%) were African-American. Six (33%) were currently employed at time of the interview. Sixteen (89%) had children, including eight (44%) who currently were caring for those children. Twelve subjects (67%) had completed at least a high school education, including five (28%) that had schooling beyond high school. Eleven (61%) noted a past history of substance abuse. Researchers examined the transcript and three emergent themes (social factors, illness factors, and other societal pressures) were derived after data saturation. The most commonly represented theme had to do with social factors, described 175 times by subjects (Table 1, Figs. 1, 2). We identified seven subthemes to social factors, including medical systems support (n=69), stigma (n=26), family support (n=29), compliance for children (n=21), community support (n=13), faith (n=10), general life experiences (n=7). 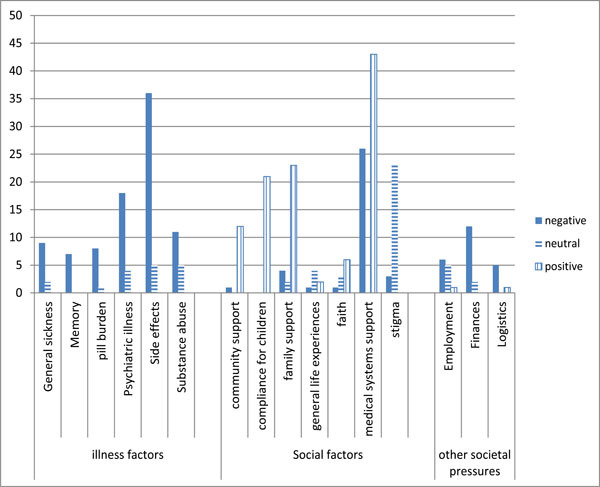 Bar chart of themes and subthemes showing impact on adherence. Schematic diagram of themes and subthemes. Total theme and subtheme counts. Several (n=7) described having specific problems with their short-term memory, and felt this negatively impacted their adherence despite their desire to overcome it (Figs. 1, 2). The third major theme identified by the authors as relevant to adherence was characterized as ‘other societal pressures’. Subthemes for this included finances (n=14), logistics (n=6) and employment/job issues (n=12). These factors were nearly all perceived as barriers (23/32, 72%) or neutral to adherence (7/32, 22%). We found that relationships with providers, children, family, and community were the most common factors with a positive effect on adherence. Similar to our findings, other authors noted positive association between strong patient-provider relationships that included open communication and respect were associated with better adherence [7, 9, 11-13, 15, 21]. Conversely, we found that poor patient-provider relationships were a major impediment to adherence. Other authors report similar results, specifically noting that trust issues and lack of perceived empathy from providers were associated with non-adherence [1, 7, 9, 12, 13, 22]. While one author found negative relationship between adherence and childcare responsibilities , our findings mirrored those of Wood et al. , in which compliance for the sake of dependent children was noted as a universally positive factor in adherence. Similar to others, we identified psychiatric issues, including alcohol and substance abuse [1, 10] and medication side effects [1, 7, 9, 10, 12] were important barriers to adherence. While stigma from family, providers and the general community was a nearly universal theme represented in our interviews, we did not identify a negative impact on adherence compared to other studies [7, 13, 14, 23]. This study used virologic failure as one of the major inclusion criteria, allowing us to capture the voices of women with an objectively documented treatment failure measure associated with their subjective narratives of non-adherence. Our semi-structured interview method allowed us to identify some patient-centered themes that often do not emerge from studies using structured written surveys. The major limitations of this work include that it was a single center study on a small number of subjects, making it difficult to generalize the results to other communities and socioeconomic groups. Identification of non-adherence is a critical part of care of the patient with HIV. We echo the recommendations of others who suggest that adherence should be directly measured through readily available methods such as patient surveys, pharmacy refill data , as well as objective laboratory tests such as virologic failure for those on ART. Depression screening should be performed at regular intervals, and intervention resources should be provided at the location of the screening, as depression has been found to be a major barrier to adherence in multiple studies as discussed above. When non-adherence is identified, interventions should be patient-based and targeted to match barriers identified in women’s daily lives, including coping with side effects as well as substance and alcohol abuse [7, 14, 22]. As much as possible, continuity of care should be maintained to establish and preserve confidence in the medical system due to the huge impact this factor has been shown to have on adherence. This will likely foster strong patient provider relationships, hence impact adherence positively. One future avenue of research could include the effectiveness of interventions to help providers build rapport with patients. Motivational interviewing techniques, voice and text reminders and use of outreach resources , including peer group support , all deserve further study of their direct impact on adherence. The authors acknowledge Adriana Knautter for her services in Spanish interpretation. Catz SL, Kelly JA, Bogart LM, Benotsch EG, McAuliffe TL. Patterns, correlates, and barriers to medication adherence among persons prescribed new treatments for HIV disease Health Psychol Off J Div Health Psychol Am Psychol Assoc 2000; 19(2): 124-33. Ickovics Jr, Meade CS. Adherence to HAART among patients with HIV breakthroughs and barriers AIDS Care 2002; 14(3): 309-18. Bärnighausen T, Chaiyachati K, Chimbindi N, Peoples A, Haberer J, Newell M-L. Interventions to increase antiretroviral adherence in sub-Saharan Africa a systematic review of evaluation studies Lancet Infect Dis 2011; 11(12): 942-51. CDC - Slide Sets - Resource Library - HIV/AIDS [Internet] Available from http: //wwwcdcgov/hiv/library/slideSets/indexhtml cited Sep 18 2013. Knobel H, Urbina O, González A , et al. Impact of different patterns of nonadherence on the outcome of highly active antiretroviral therapy in patients with long-term follow-up HIV Med 2009; 10(6): 364-9. Murphy P, Cocohoba J, Tang A, Pietrandoni G, Hou J, Guglielmo BJ. Impact of HIV-specialized pharmacies on adherence and persistence with antiretroviral therapy AIDS Patient Care STDs 2012; 26(9): 526-31. Roberts KJ, Mann T. Barriers to antiretroviral medication adherence in HIV-infected women AIDS Care 2000; 12(4): 377- 86. Puskas CM, Forrest JI, Parashar S , et al. Women and vulnerability to HAART non-adherence a literature review of treatment adherence by gender from 2000, to 2011, Curr HIV/AIDS Rep 2011; 8(4): 277-87. Abel E, Painter L. Factors that influence adherence to HIV medications perceptions of women and health care providers J Assoc Nurses AIDS Care JANAC 2003; 14(4): 61-9. Wood SA, Tobias C, McCree J. Medication adherence for HIV positive women caring for children in their own words AIDS Care 2004; 16(7): 909-13. Mills EJ, Nachega JB, Bangsberg DR , et al. Adherence to HAART A Systematic Review of Developed and Developing Nation Patient-Reported Barriers and Facilitators PLoS Med 2006; 3(11): e438. Misener TR, Sowell RL. HIV-infected women’s decisions to take antiretrovirals West J Nurs Res 1998; 20(4): 431-7. Roberson DW, White BL, Fogel CI. Factors influencing adherence to antiretroviral therapy for HIV-infected female inmates J Assoc Nurses AIDS Care JANAC 2009; 20(1): 50-61. Sankar A, Luborsky M, Schuman P, Roberts G. Adherence discourse among African-American women taking HAART AIDS Care 2002; 14(2): 203-18. Richter DL, Sowell RL, Pluto DM. Attitudes toward antiretroviral therapy among African American women Am J Health Behav 2002; 26(1): 25-33. Steiner JF. Rethinking adherence Ann Intern Med 2012; 157(8): 580-. Hansen EC. Successful qualitative health research : a practical introduction Allen & Unwin 2006. HAB HIV Performance Measures [Internet] Available from http: //habhrsagov/deliverhivaidscare/habperformmeasureshtml cited Nov 25 2013. Catherine P, Nicholas M, Jennie P. Synthesising qualitative and quantitative health evidence a guide to methods a guide to methods McGraw-Hill International 2007; p: 222. Ebrahim S, Bowling A, Eds. Handbook of Health Research Methods Investigation, Measurement and Analysis McGraw-Hill International. 2005; p: p. 639. Powell-Cope GM, White J, Henkelman EJ, Turner BJ. Qualitative and quantitative assessments of HAART adherence of substanceabusing women AIDS Care 2003; 15(2): 239-49. Sylvain H, Delmas P. Readiness in HIV Treatment Adherence A Matter of Confidence.An Exploratory Study Open AIDS J 2011; 5: 119-24. Katz IT, Ryu AE, Onuegbu AG , et al. Impact of HIV-related stigma on treatment adherence systematic review and metasynthesis J Int AIDS Soc 2013; 16(3)(Suppl 2 ): 18640.